Factory or construction workers are classic examples: critical attributes, such as strength and flexibility, atrophy with age. 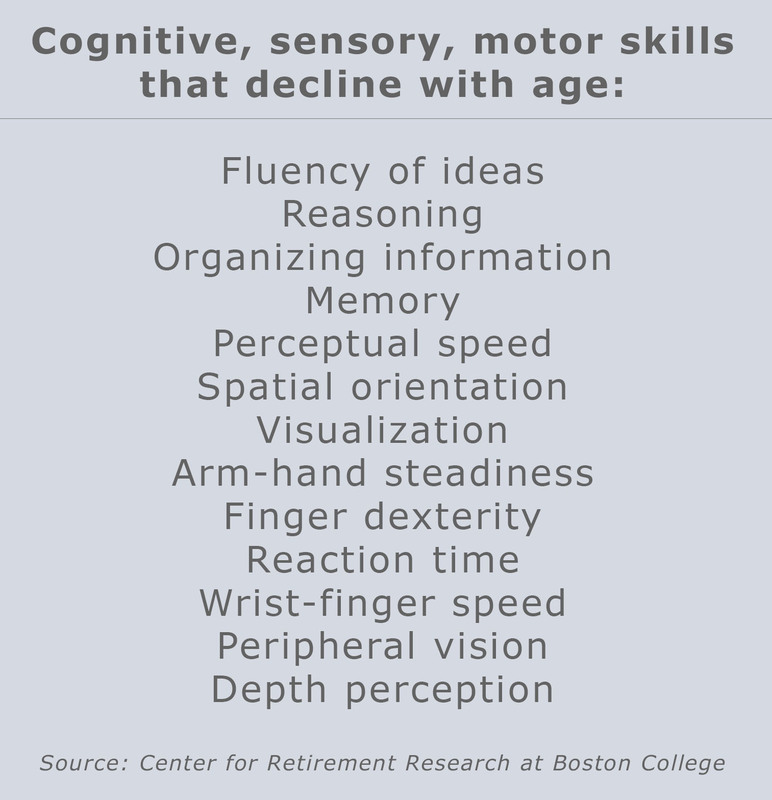 But so do many cognitive and other requirements common to both white- and blue-collar jobs. Memory slips, eyesight blurs, and reaction times are no longer as sharp as they used to be. Many white-collar occupations stand out for being dependent on skills that tend to fade. Police detectives are reliant on deductive reasoning to solve cases, making this profession among the most susceptible to cognitive decline. The study found that detectives are just as likely to experience age-related difficulties as assemblers of machinery and equipment, who require skills ranging from interpreting blueprints to finger dexterity. Or consider electrical engineers whose problem-solving skills erode with age. This makes them about as vulnerable as aging restaurant cooks, who lose the physical strength they need for kitchen work, as well as the ability to mentally catalogue customers’ orders and other information. Other highly susceptible white-collar jobs include supervisor, administrator, pharmacist, secretary, licensed practical nurse, and professional photographer. These and other white-collar professions are reliant on various cognitive and sensory skills assessed in the study and listed in the above box. Blue-collar workers remain the most susceptible to age-related declines. But, “The notion that all white-collar workers can work longer and all blue-collar workers cannot is too simplistic,” the researchers conclude. “As long as you tell me about this change ahead of time” is always my response to hearing about Social Security changes. Given enough years lead-time, I could always increase my own retirement savings contributions to make up for an impact to the Social Security payout. Just no last minute surprises, please. This is why employers encourage workers to retire at their full retirement age or sooner. You have a employees with declining abilities having the highest salaries, wages, and benefit costs. It’s no wonder that so many employers offer early retirement packages. The attacks on Social Security (think about the name of the program) began as soon as the bill was passed in the mid 1930’s as the first significant policy action of the Roosevelt Administration. It worked fine. The turn to right wing populism in the 1980’s allowed the idea to gain legitimacy that society could not afford to provide for old age. This also worked to cover the emerging consensus in public health that a single payer health care initiative of some kind was essential. Now 30+ years later everyone is convinced of two lies: we cannot afford the old OR the sick.